I just love Easter. Celebrating the Risen Savior. My Savior. And to be honest, I can sometimes cringe at the commercialization of this day since it is the crux of what I believe. My salvation, my faith would be for naught if it was not for the resurrection of my King, Jesus. Is there a slight void you are experiencing? Perhaps you feel like the world has tipped a bit on its axis. Has the section of your brain where all things creative and inspired suddenly dulled and you feel the source of your muse has left you bewildered? Have I just completely ruined your day that I dare do a post that is bereft of not one nifty little tip but two? I have made a complete fool of myself for thinking Two Tips Tuesday is the foundation of my blog and I am otherwise purposeless without it. To be honest, it is a relief that I can come here and confess that I am spent for the time being. Mentally exhausted from this life as a wife, mommy, and somewhat consistent blogger. I got nothing, friends. I tried some things this week but they just did not work. So I decided to share with you my "fail attempt tips" that should make you smile. How about how I tried making my own liquid starch from corn starch and water hoping to produce these magnificent eggs made out of ribbon or yarn or twine. You've seen them out there. 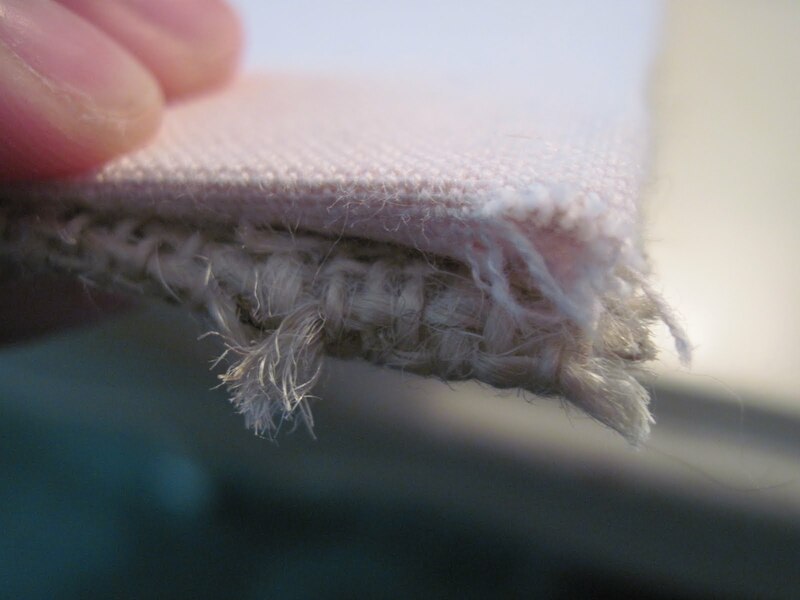 What I really need is fabric stiffener or commercial liquid starch. But I am lazy, cheap and petrified to bring Cati out in public. You know. Since she has decided that being a legally defined public nuisance through shrill screaming and screaming the word "NOOOOOOOO." It is best described as a half growl that surprisingly mimics an electronic voice that deepens when the batteries begin to die. Frightening. So at first, I tried using spray starch. 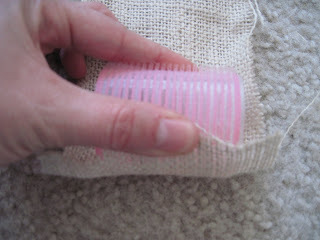 I figured if I sprayed it directly into this pretty, plastic green cup I had on hand, fill it up and soak some yarn, it will work. I scoffed at the expiration date of 2007. How can it possibly not work? Um, hey craft genius. It expired like 3 years ago. But I press on. Determined not be intimidated by that mocking expiration date. Finally, my fruitless efforts woke me up but not before I had a chance to leave it on the table hoping to find other inspiration and in the meantime my Ella drinking this expired starchy stuff in the pretty green cup. Poison control was gracious and only slightly snickered at my panicked call. I mean, wouldn't you panic if the can says "could be fatal if inhaled?" I figured digesting it would prove more harmful. Fortunately, corn starch is the primary ingredient and did I mention it was expired? 3 years ago? I did? Oh, good. After I make the corn starch concoction and decide that since I could possibly have a Guiness Book of World Records dental floss collection (Father-in-law is a dentist and my father is just plain fanatical about dental care) maybe that might work to starch and wrap around a balloon shaped egg. I decided that the minty smell was actually a bonus to this flash of brilliance but it also did not work. Back to the drawing board. 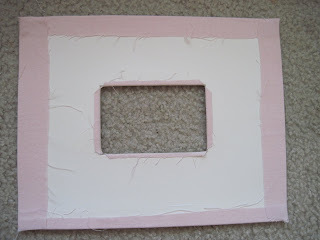 Next attempt at a fun tip was making a sconce out of a picture frame and glass votive holder. 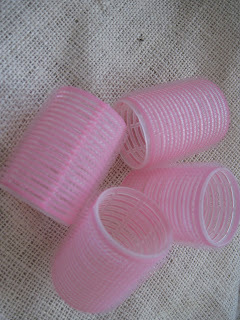 But as I went to purchase these items with both Ella and Cati inside the cart, they decided to experiment with gravity, laws of physics, and shelves full of these glass votives. It was time to not only vacate the premises but flee the city. 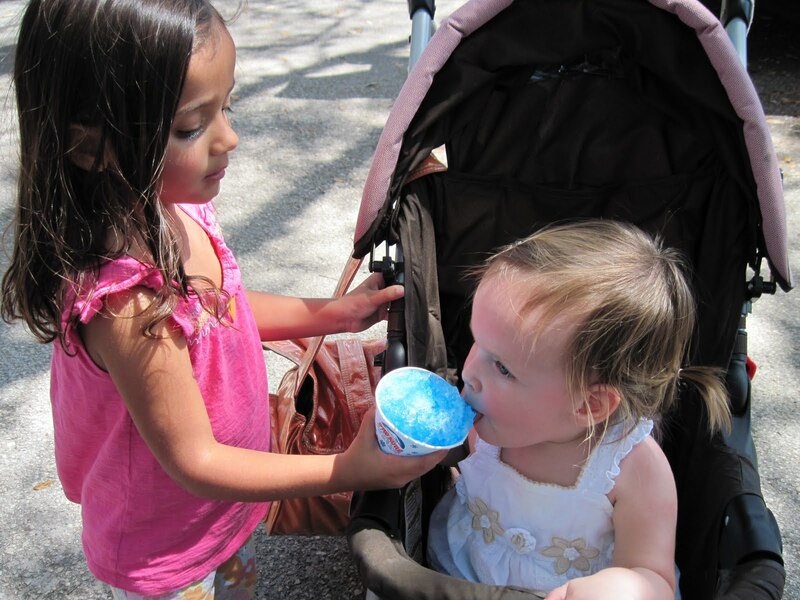 Just so you know she is not demonically possessed I am sharing this sweet moment on Saturday by inserting this quick pic of the girls. See? She shares. Screams like a loon in all places public but I take what I can get. I guess now I should say I am sorry for no Two Tips. I am here, at home this Monday night, just daydreaming about my future house with my husband and mentally redesigning the master bedroom and bathroom. I have so many ideas and so little cash. Sigh. Groan. Here is the tub. What on earth is up with this blah and ugly gray tile? I think if I kept it I would feel like I was bathing in a jail cell. Do jail cells have garden tubs? And what is that ripped up paper thing. I do NOT want to know. Doesn't the blue painter's tape look menacing? Wouldn't you be afraid an alarm bell would go off if nature called while looking at this house? Would you risk it? I sure didn't. And with the unfinished floor it just felt...shudder...gross. But there is the loo. And the attractive dull gray toilet roll dispenser. Suddenly, I feel closer to each of you. Here I am sharing with you my future commode. It feels intimate. We must be digging deep together, friends. Are you feeling our bond grow like I am? Oh, this shower. It is OK but I am hoping our friend who is a contractor can come up with a much more current and spa-esque shower solution than this. But again, money is always a factor. But I believe some chiseling may be required to clean this sucker. Pray for me. Better yet, just hold me. Last but certainly not least would be this fabulous pink double vanity. The picture is awful but so is the vanity so I have spared you from defiling your eyes. 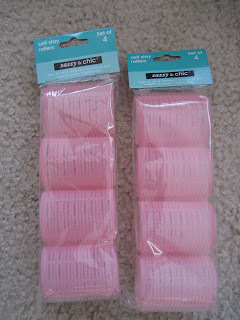 I have a complete devotion to the color pink but you will find almost NONE OF IT IN MY DECOR. My style is kinda cottage, a pinch of beachy, a dash of shabby, a huge dose of comfortable and cozy but NO PINK in my bathroom. I think I have made myself abundantly clear on pink in my bathroom. So I leave you all with no tips. 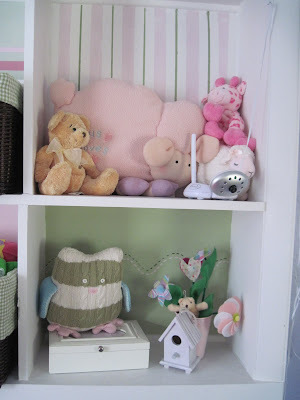 And I will confess I inserted that picture of my girls after writing this post because there was no way I wanted my blog to appear on any of your blog lists with that unfinished bathroom as the photo that went with the post. Perhaps I have decor vanity issues but I accept this flaw with gusto. In fact, I embrace it. 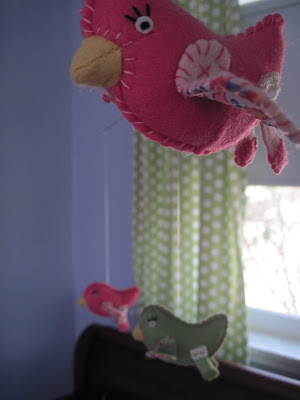 I have not forgotten to give you a tour of Cati's room as part of my goodbye to this house. But it is strange to have one foot in one house and one in the other. I am sure so many of you can relate. So happy Tuesday friends. 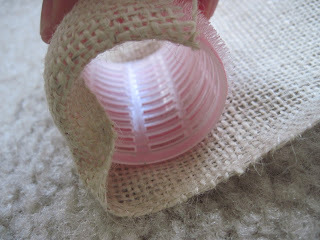 Hope you enjoyed my failed attempts at tips and my ghetto pink future bathroom. God has gone before us. As of today, the sellers signed the contract offer and as soon as the bank approves, we will be under contract for this house. I just sighed with the goodness of God. Did you? It is no way near over and the bumpy ride to a closing table is just beginning but I am so excited! I am so grateful for all of your emails, comments, and sweet reminders of the goodness of God. I can't wait to show you around my house and share with you the plans we have to make it our home. Just wanted to check in with you all on the house news. There are other things a brewing in my crazy life but I will hold off to share those. Let's deal with what's on the plate in front of me, shall we? 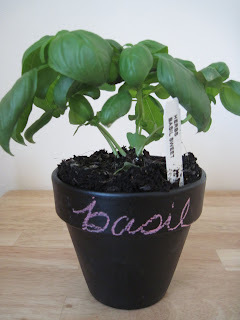 My hope is to be back to writing my normal posts and random musing on life as I know it. This has been a whirlwind ride but you all have hung in there with me. In the meantime, I want to say goodbye to my current house. 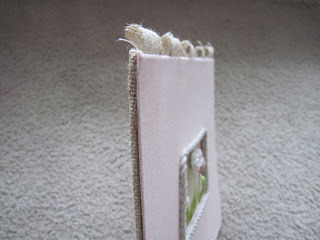 By no means is it this magazine level house but it is our home with precious memories attached. We started our family here and I want to share with you the various rooms in my house that have meant so much to me. I have planned on doing this for awhile and then my sweet friend Libbie, over at The Middlest Sister, did a post on her daughter's room that is so gorgeous, so full of charm, and personal touches that I decided to start with Ella's room. Libbie, you inspired me girl! I just love peeking into other people's homes. Not like an internet peeping tom or anything. Can you say ewww? Just a love of decor and style. Does anyone else see a photo on someone's blog and start looking at the background checking out kitchen cabinets, flooring, and decor? Or is that just me? All I'm saying is I love to see how people live and since I don't have cable, I don't have all those shows to check other homes out. And I looooove to be inspired. So come inside Ella's room with me. This room has seen many transitions. It used to be my home office for my business, then we made it this cozy little guest room/office. 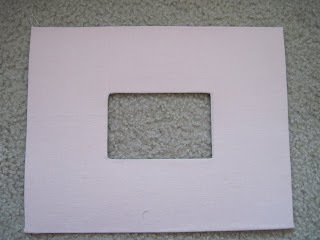 We had painted it a terra cotta color for my office and then lavender for the guest room. 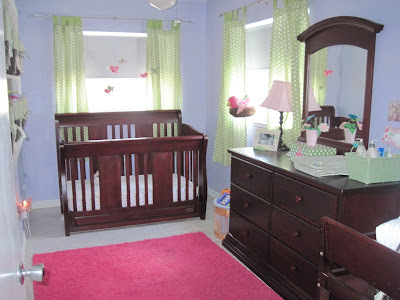 But when I became pregnant with Ella, we made it into this cute little nursery that looks...well...it looks like Pottery Barn Kids exploded in here. The lavender does not match but we kept it because it was girly. I love it. The room is apparently an add on to the house so there is no closet. There is also the back door leading to the patio in here so storage and room are a precious commodity. I had to get creative. The previous owner put in this built in bookshelf where the window used to be. It is an odd size and shape. I painted the back of each shelf a different pattern that matches the Penelope Bedding from PBK to coordinate. 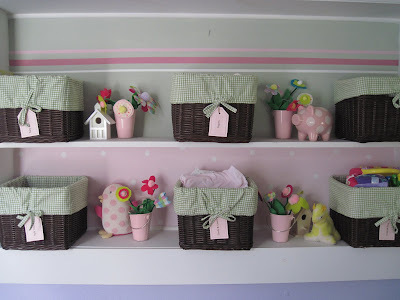 All the baskets are labeled and held stuff like diapers, bibs, little bloomers for all her dresses, toys, sheets, etc. It worked out great. 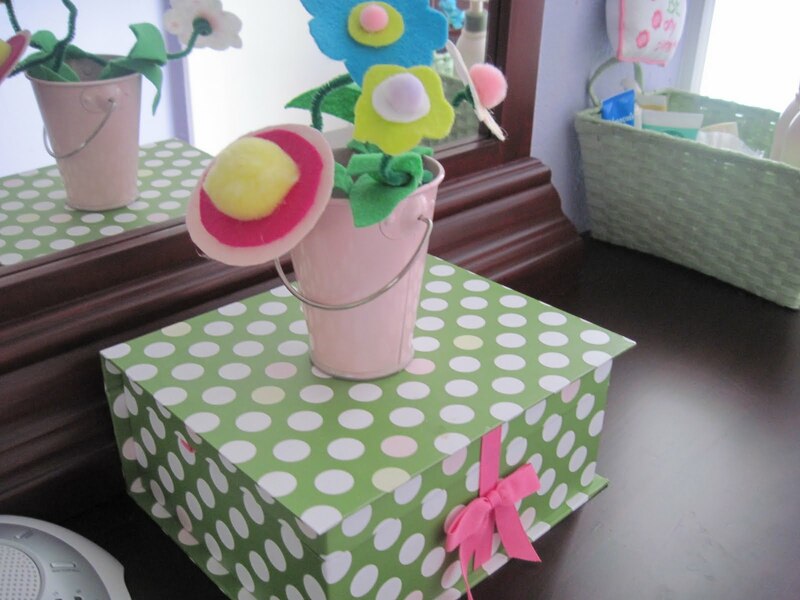 I also made all those whimsical flowers to put my own mark on the room. That little yellow Llama was in my nursery as a baby too. Awwww. This cute little box on her dresser holds her take home outfit from the hospital, her ID bracelet, and other precious mementos from my pregnancy and her birth. This fun mobile over her crib is one of my favorite things about the room. It still hangs there and it gives the illusion these birds are really flying. And the ceiling is one of my favorite things to decorate. You must always find a way to hang something from the ceiling. You just have to. Another side of that awesome shelf. 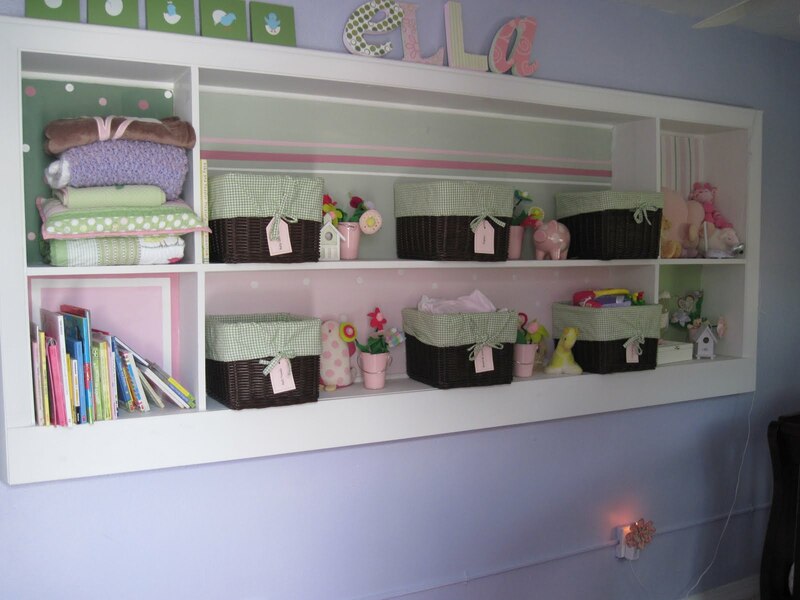 Oh, I will always remember how much fun it was to prepare this room for Ella. Just like God say He goes to prepare a place for us. There is so much love and anticipation attached to it. And of course we can not forget the owner of this room. My precious Ella. 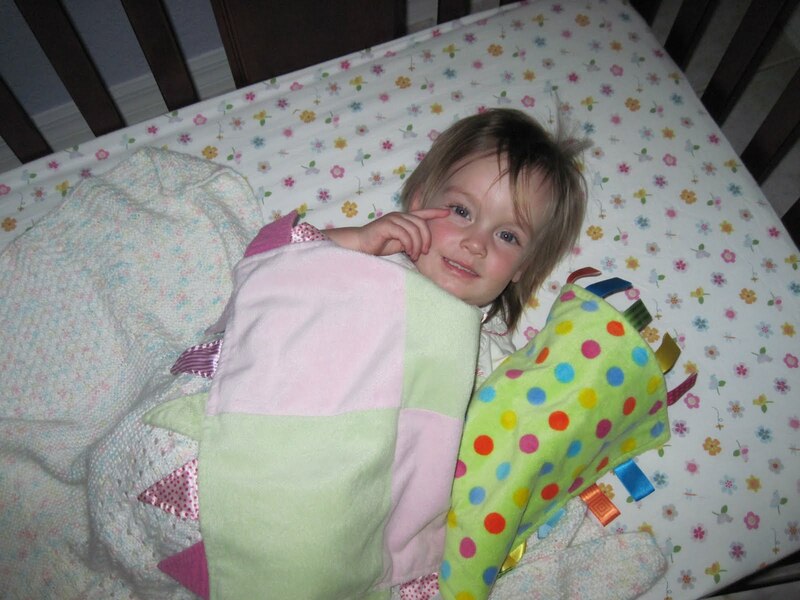 Who was just put down for her nap in this picture. Don't you just want to reach in this picture and give her a big hug and kiss? How I love that baby. Did you like it? That was kind of fun! I think I will do Cati's room next. It is not life or death but seriously this house saga is spiraling out of control into a dimension that looks nothing like reality. So we find out this morning that the sellers turned down our offer due to the poor quality of buyers (us) because we have been sued by our landlord and evicted in August 2009. Yes, please go ahead and read the above sentence again for clarification. I'll wait. Done? Continuing on...First of all this is wrong, wrong, wrong because we have lived in our house for 6 years, have excellent credit and have never been sued or evicted. Can you say our house buying process has become Satan's playground? Secondly, the seller's divorce attorney has poorly advised them to take the house off the market for 30 days. Oh, this is just bad. Both realtors and brokers are getting involved because no divorce attorney needs to be giving advice about real estate, this market is in the dumps and will continue to descend within the next 30 days, and...I have just stepped off my soap box. Bottom line, our lender sent a letter to the realtor declaring our excellent credit and past rental history and all parties involved are trying to rectify this bizarre turn of events. Isn't God good? That we can strengthen our faith remembering how He never lets us down even in the midst of colossal disappointment. And I am so proud of my husband for remembering Who our hope is and reminding me too. Here is what I am remembering today...Our integrity precedes us and God is our advocate who goes before us. Whatever is around the corner is trustworthy. Whatever it is. GOD is trustworthy and our present wants have nothing to do with His good, pleasing, and perfect will. I will confess that my first reaction to my husband was..."WE NEVER PRAYED! We got so caught up that we never prayed!" Then I stepped back and remembered that God even blesses those who don't even acknowledge Him. Then I lost my wisdom as quickly as I gained it in that moment by crying out..."We never prayed for PROTECTION! Now Satan is stirring up havoc and mischeif upon our house buying process!!!" I have not told you that I am a drama queen for nothing. But in that statement I completely succumbed to my propensity of being a Control Freak Drama Queen. That title so deserved a bigger font size. I mean, why must I assume my lack of praying will suddenly result in imminent disaster? In that line of thinking, I act as though God is my vehicle and I am the driver steering him to and fro. Father, I confess to you now my utter helplessness without you. I ask your forgiveness for diminishing Your sovereignty in all things. You are a good God and I trust you. I lay this here at the foot of the cross. Your will, Lord. Not mine. In Christ's POWERFUL and MORE THAN ABLE name I pray, Amen. Friends, I ask for prayer. For our hearts and for where we will live. I pray this is the house but I want an open heart even more. A heart after God's own heart. This was one of those projects that got into my head and I could not let it go until I did it. I have this happen to me frequently about something I want to write or something I want to make. It will plague me until I see it through. 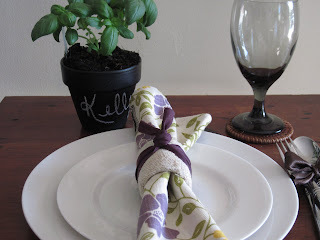 I truly love how this turned out so if you are curious how I made it...read on. 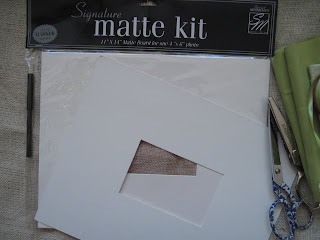 I found these photo mat kits at the dollar tree and really thought they would make a great craft project. 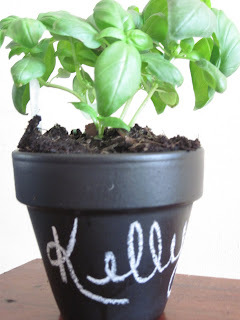 They are the ones used for signatures at weddings or birthday events. 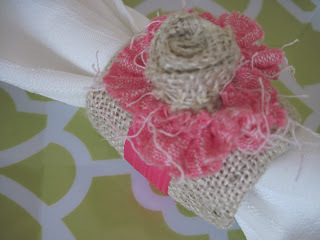 The idea popped into my head after I started playing around with burlap and was itching to make tiny, sweet flowers for Spring. I also wanted to use only materials I had on hand since I was not sure how this project would work. 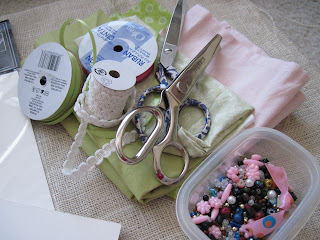 I am a crafter who wings it from start to finish and learns along the way. 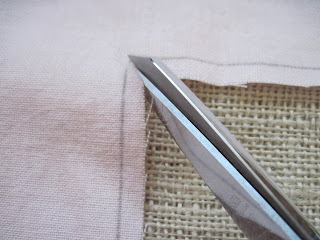 I first cut out a square of burlap slightly larger then the opening to the photo mat. 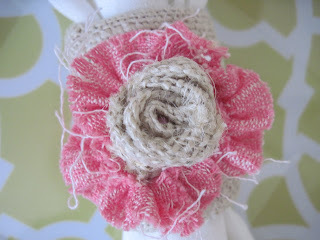 Then I made my flowers from scrap fabric and ribbon. 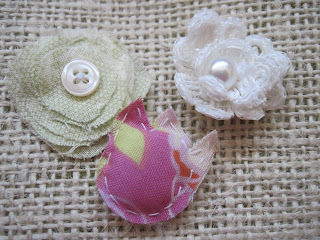 I wanted them to be 3 dimensional so I added a button on the circle flower and frayed the fabric. 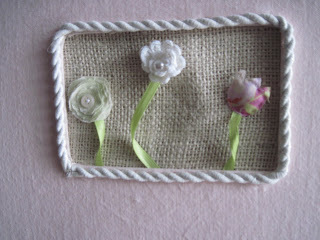 I turned the white ribbon into a layered flower and sewed a pearl in the center. 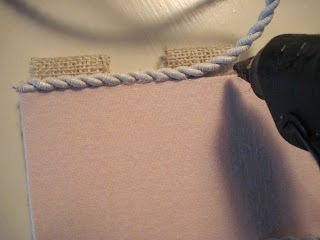 The tulip is fabric sewn together and slighty stuffed with polyfil for dimension. 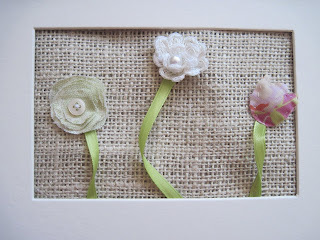 I wanted the stems of the flowers to also be 3 dimensional and give a sense of movement. 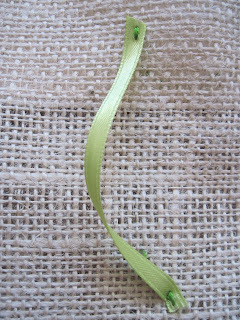 I used thin, green ribbon a twisted them until I was pleased with the look. I pinned them into place. 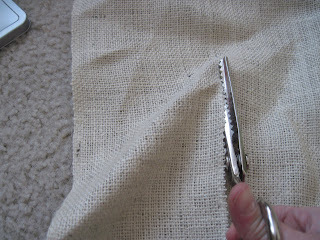 I then only sewed a tiny stitch on the top and bottom so that the twisted part popped off the burlap. 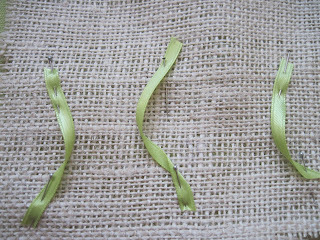 After securing the stems, I sewed the flowers in place. 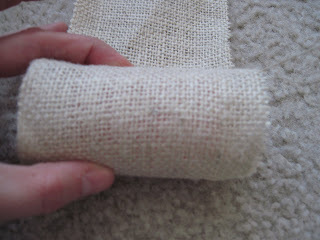 To cover the mat, I used a dish towel used from another project. I cropped it around the mat and then cut out 4 squares on each corner. 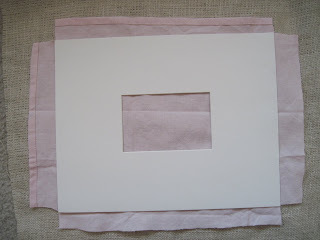 I traced the opening of the photo mat, then traced a 3 x 5 card in the center of that to create the opening in the towel. 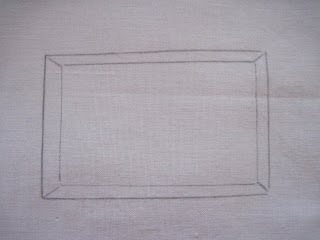 If I could do it again, I would have traced a smaller square. And done this more meticulously. I also drew a diagonal line in each corner. I cut on that diagonal to create flaps in the opening that I could fold back. 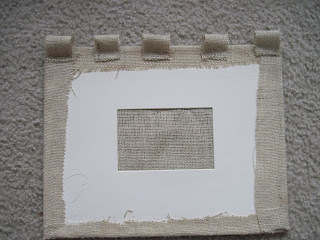 I cut 5 strips of burlap to make loops and hot glued them to the burlap backing piece. 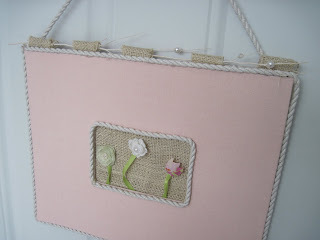 I glued the burlap square with the flowers sewn on the opening of the pink covered mat. If I could do it over again, I would have mounted the flower square onto something sturdy like a piece of cardboard. 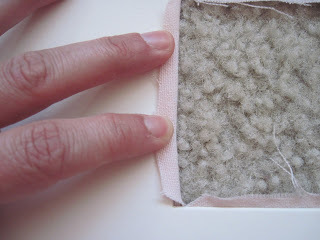 Then I hot glued the two mats together. 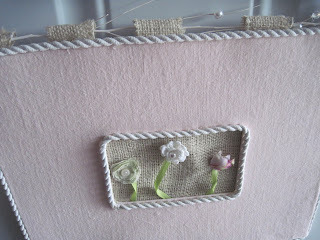 The edges are rather messy and the frame was kind of boring so I used some white cording I had to frame the flowers as well as the edge of the frame using hot glue to adhere it. I was going to buy a dowel to put through the loops but I have been so busy with the house thing that a trip to the craft store was out. Once again, I was forced to improvise so I used a white floral branch I had and glued pearls and crystal beads to it and to match the delicate look of the flowers. It turned out so nice! 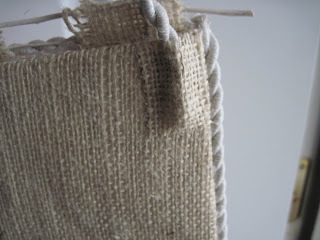 I glued the cording to the back with hot glue and then covered it with burlap and to make it look clean and neat. There you have it! 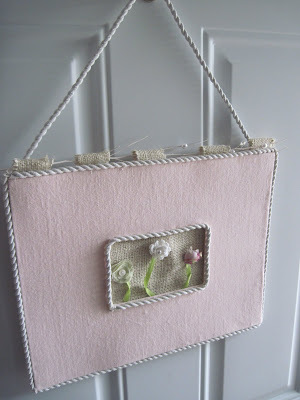 A pretty Springtime Door hanging made with photo mats! 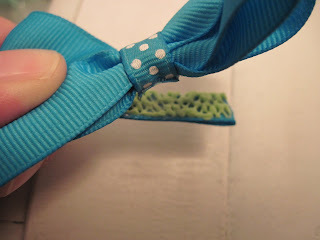 I had been working on another tip for 2 days that has not been working out so I consider it such a blessing that I came across this tip via One Pretty Thing who featured Treasures for Tots with this quick tutorial on putting non-slip grip to a girl's hair clip to keep it from slipping. Both my girls have fine hair and I thought this was genius! 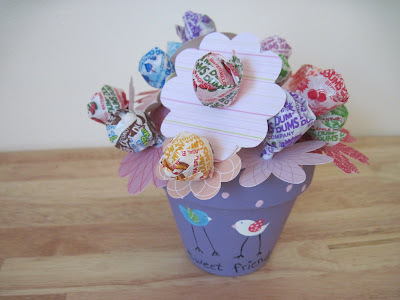 Apparently, this clever idea has floated around the blogosphere and I am the last mother of girls on earth to be clued in. So in case any of you are like me, there's the scoop! (above picture is my version). I am beyond thrilled but I am trying to guard my heart. Look at Cati saying Welcome Home! Actually, she kind of looks like she just yelled Get Off My Property! But I choose to believe she is the friendly, neighborly sort of girl. Cati and me posing for a pic out front. I so wish I cropped out my caboose in this pic. It is moments such as these that I am reminded that I need to lose the 30 pounds I gained preggo with Ella. But then I go eat a cheeseburger and get over it. I really did. Family pic with our realtor's phone. Now Ella looks like the angry, unsocial neighbor. And Cati is laughing at people. This does not bode well for my parenting skills. They look much more friendly here. Not far at all (actually closer than the other house). It needs some work done but mostly cosmetic. It is a short sale that a buyer just backed out of due to the long wait and was about to be approved by the bank. We stepped in and took over the same offer to the bank. God's hand is all over this and if this house works out, so much makes sense now. This is not a dream home. But it is a super nice home!!!! It is worth far more than we would pay for it and after we get done with it, I think it will be lovely. I am excited to invite you along for this particular ride too. Thank you to all of you who have emailed me to find out how it is going. Figured you would enjoy updated pics of the girls and my rump. When we are pretty sure about how thing are going and it will be ours, I will invite you for a tour inside. Take care, my sweet friends. Thank you so much for your care and loving comments. 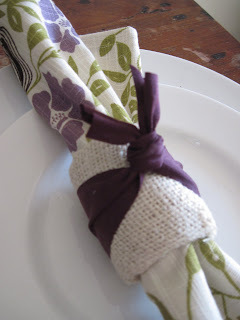 I am realizing I am only really posting on Two Tips Tuesday and that is not good. I love all of you and I miss updating you on this pink life I have going here. So let me share about our house hunt that is all consuming and so incredibly hard. Well first of all, the house we initially put an offer on? It floated back to us for another opportunity with family offering us money to buy and close on it and the sellers still said no. Can you say we are rather thick headed? I imagine my actions could possibly emit a slight sigh from the King of Kings. I think my actions can be that exasperating. But I am loved and cherished by God. I know. So tomorrow is kind of a pivotal day because we are searching in an area we had not considered and would not have considered since it is kind of far away. It is north of us (and my peeps who live near me already know where I am talking about I am sure). For those of you who don't know, where we live in kind of expensive. The cost of houses in our county may be considered highway robbery by some. 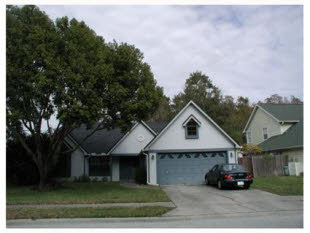 It is kind of weird but north of us, you get a whole lot more house for your dollar. So we are going to try it and see what happens. We already have some lovely houses to look at tomorrow so please pray. We basically have one more week to find a house and be under contract before renting is the inevitable only option. I will keep you posted. Until then, forgive me for infrequent posts. I have also been unable to visit a lot of you which makes me sad too. I will be back on my game soon. Promise!